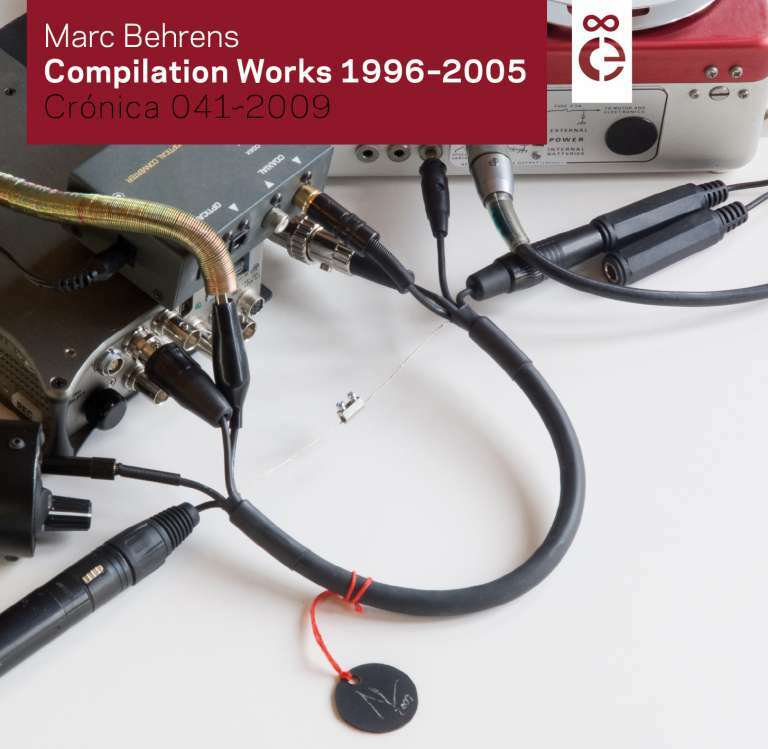 Compilation Works 1996–2005, the first ever authorized online album release by Marc Behrens, features 19 tracks, previously scattered over compilations and reinterpretation projects (by artists like Disinformation, Ralf Wehowsky, John Hudak, Ilios, and others) from a 10 year period. Most of the works were short one-off conceptual pieces, but, listened to in this new sequence, they reveal common strategies, mainly because many of them feature characteristics from Behrens’ album works, carried out over a sometimes extremely short duration. The personal shifts in technology, the state of sound research and of processing techniques occurred during the period in which the works were realized turn this release into a good opportunity to explore how Marc Behrens’ work kept a unique consistency under varying conditions and while exploring different concepts. All works have been carefully remastered and can be considered as definite versions. Dedicated to the Coca-Cola Company. A light-to-sound transducer was utilized to generate the basic sound material. Composed November–December 1997. Previously released on END ID [double CD], Digital Narcis, Japan, 1999. A reinterpretation of music by the band TV Pow. This track is entirely untitled and nameless. Composed November 2002. Previously released on TV Pow, Powerful Friends and Devoted Lovers [double CD], Bottrop-Boy, Germany, 2004. A reinterpretation of music by Disinformation. Composed 1996 at trente oiseaux studio, Koblenz, Germany. Previously released on Antiphony [double CD] Ash International, U.K., 1997. Contains parts of a live recording made in September 1999 at the late Staalplaat Audio Gallery, Berlin, Germany. Composed spring 2000. Previously released on edition… xv [CD], edition…, USA, 2002. Composed 2000. Previously released on 10 x 10 [5 tape boxset], Banned Production, USA, 2001. Based on John Hudak’s composition Don't Worry About Anything; I’ll Talk To You Tomorrow. Composed May–June 2000. Previously released on John Hudak, Helene Marie: Reinterpretations [double CD], Alluvial Recordings, USA, 2002. Composed January 1998. Previously released on meme [CD], Meme, Japan, 1998. A reinterpretation of a 13-second melodic fragment by Ilios. Dedicated to Dimitris Kariofillis, offering him a few minutes of my breathing and my heartbeat. Composed 2004. Previously released on Ilios, Encyclopedia reworked [CD], Antifrost, Greece, 2004. Basic material recorded in taxis and bars in Lisbon at the breakout of the war on Iraq. Composed 2003 in Grimacco (UD), Italy. Previously released on 60 sound artists protest the war [CD], ATAK, Japan, 2003. Inspired by photographs of heaps of disintegrating magnetic audio tape found on lampposts in Afghanistan. Composed October 2001. Previously released on sul – dedicated to Chris Marker [CD], SIRR, Portugal, 2002. Inspired by Gesang der Jünglinge by Karlheinz Stockhausen. To use sounds of fire was the only decision influenced by Stockhausen’s text choice, it is the figurative continuation of the fiery furnace without any youths. I have no intentions of any further, let alone religious meaning. Composed 2004. Previously released on Untitled Songs – 49 Years from Gesang der Jünglinge (2005–1956) [double CD], Sirr, Portugal, 2005. [rim of everything/nothing, to focus, accumulating/radiating energy] The three parts of the piece correspond to certain symbolic notions of the circle, as indicated in my interactive sound installation Tokyo Circle. Composed 1999. Previously released on Sound Art – Sound As Media [book + CD], ICC-InterCommunication Center, Japan, 2000 and b!as, International Sound Art Exhibition [book + DVD], [email protected], Taiwan, 2005. Based on a live performance at Galerie für Zeitgenössische Kunst Leipzig in September 1999, during which I hyperventilated for the first time playing a concert. Composed 2000. Previously released on New Forms [double CD], raster-noton/Galerie für Zeitgenössische Kunst Leipzig, Germany, 2000. Dedicated to Lida Patta. Composed 2003 in Grimacco (UD), Italy. Previously released on Void [CD] Antifrost, Greece, 2003, released as a set together with the CD Full. A cross-reading of Ralf Wehowsky’s sound works. Composed 1996–1997 in Frankfurt and Karlsruhe, Germany. Previously released on rlw, Tulpas [5 CD set], Selektion, Germany, 1997 and Marc Behrens, Architectural Commentaries [CD], CMR, New Zealand, 2001. Composed 1993, re-edited and mastered 1999. Previously released on variious [double CD], Intransitive Recordings, USA, 2000. Composed 1999. Previously released on Modulation & Transformation 4 [3 CD set], Mille Plateaux, Germany, 1999, published by Rückbank Musikverlag. Based on sounds of breathing, saliva, hitting teeth and sucking microphone membranes. I accidentally burned my cheeks during the recording. Composed 2002. Previously released on Trybryd > Installation Soundtracks [CD], Beta-Lactam Ring Records, USA, 2003. Composed 2001. Previously released on State of the Union 2.001 [triple CD] Atavistic/EMF, USA, 2001. (in no particular order) Francisco López, Bernhard Günter, Erik Benndorf, Stephen Fenton, Mike Harding, Joe Banks, Marutani Koji & Akiko, Brent Gutzeit, Peter Wießenthaner, amk, John Hudak, Sasaki Atsushi, Shibuya Keiichiro, Paulo Raposo, Hatanaka Minoru, Carsten Nicolai, Olaf Bender, Stephanie Sembill and the staff at Galerie für zeitgenössische Kunst Leipzig, Dimitris Kariofillis, Donatella Ruttar, Ralf Wehowsky, Achim Wollscheid, Vida & Elena Rucli, Howard Steltzer, TJ Norris, Florian Schmitt, Andrea Schuldt, Lars Müller, Nikolaus Heyduck, Barbara Heller, Karin Berrio, Miguel Carvalhais, Pedro Tudela, Paulo Vinhas, João Cruz. Compilation Works 1996–2005 was nominated for the Qwartz 6 Music Award in the Anthologies category. With Compilation Works 1996-2005 we present the fifth release in the Limited Series of original artworks, especially produced for each digital release. The Limited counterpart of this Unlimited release is The Recompiler, a certified signed and numbered limited edition of 19 31,5 x 31,5 cm Lambda prints, produced for Crónica by Marc Behrens.